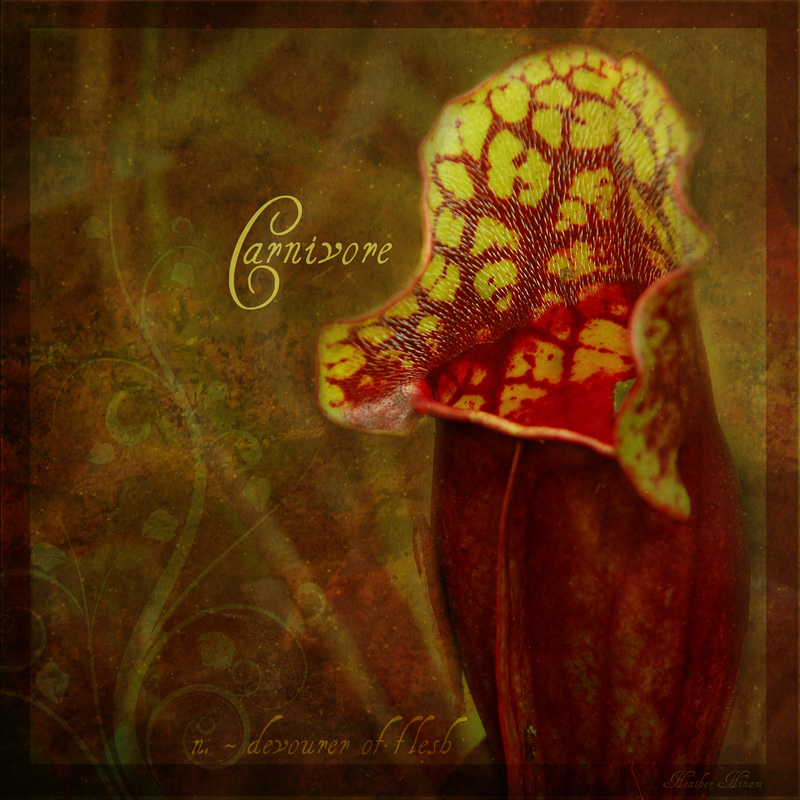 I have to admit that plants are not the first things that come to mind when I think of the word carnivore. However, after spending a morning mucking about in a peat bog last week, I was reminded that ‘meat-eaters’ can be found in pretty much any kingdom and like their animal counterparts, carnivorous plants can be as beautiful as they are deadly. In the boreal forests of Manitoba, pitcher plants (Sarracenia purpurea) are probably the most commonly encountered carnivorous plant. If you happen to stumble into the right habitat, they can be downright plentiful. We found dozens of them springing up from the carpet of sphagnum, looking like the bloodied tubes of an expansive green pipe organ. These plants are truly a wonder of evolutionary design. The pitchers are modified leaves, curled in on themselves and fused to form a vessel that holds rainwater. The fluted edges are boldly pattered to be attractive to insects. However, what an unsuspecting bug doesn’t realize is those leaves are also covered in stiff, slippery downward-pointing hairs. When an insect lands on the rim, they immediately head for the mouth of the pitcher, in search of the nectar promised by the bold colours of the plant. However, the deeper they go, the more difficult it becomes to retreat. The hairs only go one way, drawing their quarry down into their watery doom. The ill-fated arthropod eventually drops into the water and ultimately drowns, its decomposing body providing much-needed nutrients for the plant. But what would drive the evolution of such a set-up? Most plants are more than capable of feeding themselves, transforming carbon dioxide into energetic sugars through photosynthesis and drawing nutrients from the substrate they’re growing on. For pitcher plants, the big problem is finding enough nitrogen to grow and reproduce. Bogs are cold, acidic places and nitrogen is hard to come by. However, bogs have a lot of insects, flies, mosquitoes and all sorts of critters flitting about, their little nitrogen-filled bodies just there for the taking. So plants, like pitcher plants and sundews have evolved a way to take advantage of the situation and as a result, thrive in an environment where many organisms could never get a footing and those that do only manage to barely eke out a living. Although they may be hardy and can go where few vascular plants have gone before, pitcher plants are still vulnerable. Bogs are fragile ecosystems, often taking from decades to millennia to form. Forestry, oil and gas exploration, wetland draining and peat harvesting destroy these habitats, often permanently. The good news, however, is that in part because of just how hard most boreal wetlands are to get to, there are still over 100 million hectares of peat bogs and fens in Canada. Most of us don’t realize just how important these regions are. These often bleak-looking stretches of greens and browns that wrap around the boreal belt can store on average 3.5 times more carbon per hectare than the forests that surround them. They also hold vast volumes of water, slowing run-off and filtering out pollutants from watersheds. Although Canada’s peatlands are still relatively intact, the world has already lost over 25% of these wetlands to agriculture and harvesting in a number of countries, releasing tonnes of CO2 into the atmosphere and changing water dynamics. It’s a slippery slope. We’re on the lip of the pitcher plant. If we as a species don’t pull back hard on the reins of our need for carbon and other natural resources, more of these valuable sinks will be lost and we will find ourselves tumbling down into our dark pool. So, put on your boots and venture out into these wet and wonderful places. Admire the pitcher plants and other unique organisms that call this seemingly desolate place home and remember that just because something’s beautiful doesn’t mean it’s not dangerous and sometimes that which seems dull and ordinary is often extraordinary. This entry was posted in Art, biology, Boreal, botany, conservation, definitions, ecology, natural history, Nature, plants. Bookmark the permalink. Well, you’ve done it again. I absolutely love the detail in this photo. Especially the teeny, tiny little fellow down at the bottom beside your definition. (I’m quite proud of myself, I first spotted him while looking on my phone screen.) And those colours? WOW! What was the weather/light like the day you took this? And of course it goes without saying that your whole background/definition/layout is simply stunning. Thanks for sharing the beauty that most never see. Thanks, Deb. I’m glad you enjoyed the image. To tell you the truth, I hadn’t noticed the little critter at the bottom of the plant. Good eyes, especially on a phone screen. The weather was mostly overcast, but clearing and a little cool. Despite all the texturing, I didn’t enhance to colours much. They were really red. I think it was a case of good timing. The younger plants had yet to develop the red veining. I’m glad you enjoyed this glimpse into one of my favourite ecotypes. Once mosquito season is over I’ll be back into the bog to explore. Marvellous photo, informative post. Our mosquito population has been actually quite bearable this year. I’m very glad you enjoyed, the post, Sybil. Thanks for taking the time to let me know. “…like the bloodied tubes of an expansive green pipe organ.” What a great image! I appreciate the art, the information and the lesson so neatly framed in a perfect metaphor. I haven’t been out in the woods for a while – completely possessed by a right-brain project – but I think I might know a good place to look for this one. Grizzly & cougar spotted at the edge of town in the past weeks – I’ll have to tune up my singing strings. Thanks, Heather, for the artisic inspiration and the extra incentive to find the time to get the heck back outside!